This is the first Easter post kids that I can recall us parents being on our own for Easter activities. I discovered that it’s really a mini-Christmas with decorating, egg-coloring, a visit from the Easter Bunny, brunch and hiding jelly beans for the hunt. We’ve always hard-boiled eggs prior to coloring them, which means you don’t want to make them too close to Easter. By the time my week wound down and we re-grouped on Friday, two days out from Easter, all the crafts that intrigued me suggested blowing out the eggs. Foreign concept to me. We watched an MS video, which didn’t necessarily convince me it would be easy. Regardless, we forged ahead and made our list. From the millions of Martha crafts we chose the Big-Eared Bunny and the Crepe Paper Bunnies. I don’t know if I’ve ever made a recipe or craft by fully following the instructions – I’m always tweaking a bit. I call it Martha with modifications. These two crafts were no exceptions. We bought a few dozen eggs on Friday. That’s all the further we got. First thing Saturday we’re up and trying to figure this technique out. I notice our eggs have been branded. They have a “EB” on on end for Eggsland’s Best, or Easter Bunny, as I suggested to the kids. The first two explode before we can get all of the contents out. We made the mistake of making the top hole so large that the pressure from the tool was too much. As we progress, we make some adjustments – for example, really only a pin hole is needed in the top hole. In all the rest of the bunch, with two random brown eggs added (26 total), we only lose three. The third one my 5-yr-old, Calvin, held too unsteady while trying to pierce the egg with a safety pin. After we get a routine down, Calvin is fascinated by the egg scrambling and content extraction (among other names) and sticks with it for the full 23. We take a break a head to the MIA for Titian. When we proceed with the dyeing process, it’s 3:30. 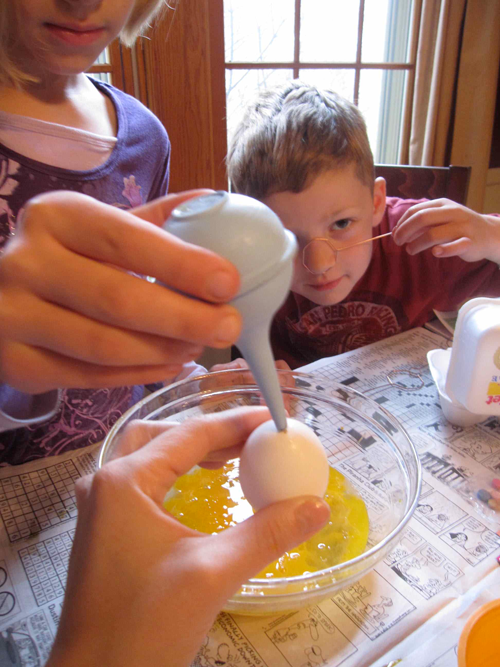 Because the eggs are hollow, they are nearly impossible to submerge in the dye. Martha recommended doing it in this order: blow out then dye. So this is a source of frustration. We finally rig it up with coffee mugs and a medium weight spoon face up to hold down the buoyant, fragile egg shells. Only once does a mug and it’s content spill. Final count are 7 pink and 4 orange for the Big-Eared Bunny craft and 12 miscellaneous colors (including one black sheep (bunny) of the family that comes from an original brown egg in midnight blue dye). It’s like 5:00 on Saturday. We leave them out to dry. I just use cookie drying racks whereas Martha has a foamcore and straight pin grid for drying. I test out the glue’s strength (weak) to adhere straightened felt ears (heavy). It’s obvious that is not going to work. We improvise with some plaid paper for ears and I get out my narrow scrapbooking tape which works wonders. The pompon noses go on with glue, I dot the eyes and stick them back in the egg carton container. I also improvise with green construction paper for the carrot tops. The 11 eggs end up in the carton which is now the garden, due to a few failed passes at the felt-bunny feet. Time for bed. Easter morning. We finish up the bunnies (close-up) in their cupcake homes pretty quickly. Again altering Martha because we couldn’t find crepe paper. Mind you, the crepe paper streamers at home are too flimsy, not the same thing as the pressed crepe paper. We settled on colored cardstock paper. I traced the 22 ears and my 7-yr-old daughter, Ava, cut them out and creased them. And as we didn’t have crepe paper for the grass in their baskets, they got the Easter basket cellophane filling. We glued on the small nose pompon and the larger tail ponpom, made the eyes and attached the ears. Now it’s 7:30a.m. I’m calling it done. Next up church, brunch and the hunt. While we’re away at church, the EB takes care of the jellybean hunt and pops in the quiche. Post ceremony, the kids run wildly around the house – only to collect like 20 jellybeans each. They did get a boomerang and a balloon machine to make fancy balloon shapes too. 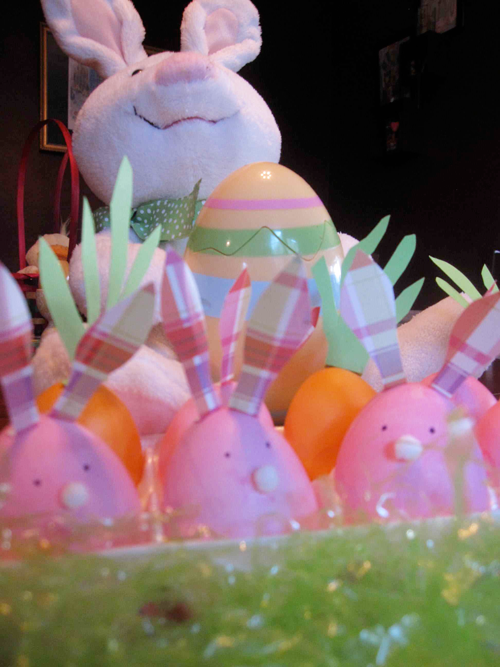 I am pleased we kept the giant chocolate bunnies out – no major feat. 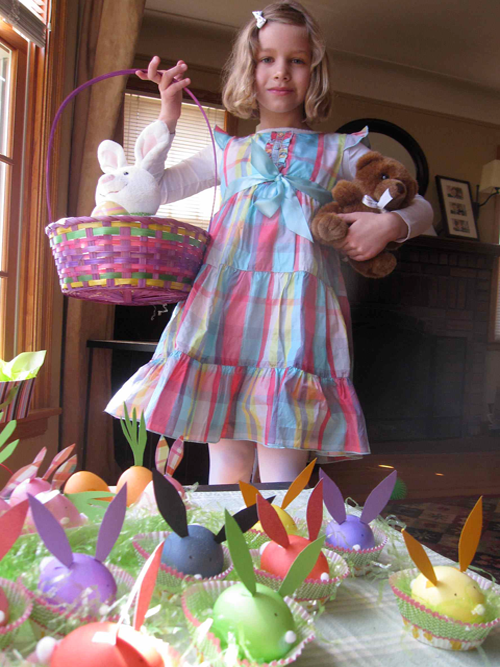 And the Easter baskets, courtesy of their Grandma, had Goldfish (crackers) and plants – great ideas. We set the table with our decor, light a few Easter candles and enjoy brunch. It’s 11:30a.m. I’m hoppy it’s all over and time for this bunny to take a nap. I was perplexed. 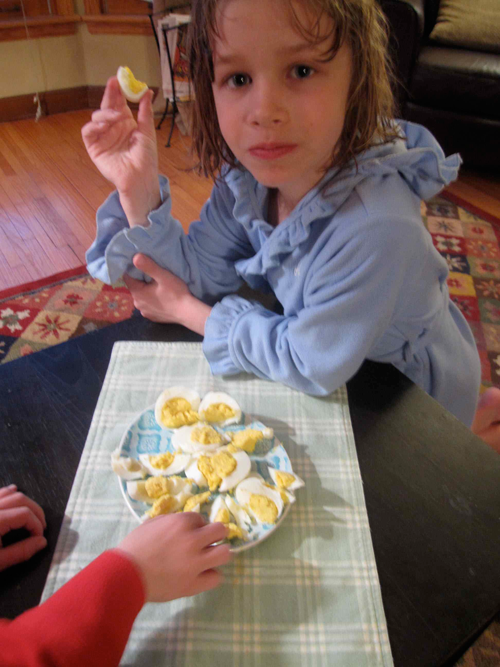 What were these little miracle egg concoctions my 5-yr-old, Calvin, described to me? He claimed he had made them several times at school (yes, his school APMS has Cooking 101: How to Outshine Your Mother in the Kitchen). The details seemed very elaborate: hard-boiling eggs, cutting them in half, taking out the yolk, mashing and re-shaping them. Best of all, they were so delicious! I was not connecting. Calvin was so stoked about them, he insisted on showing me how to make them. Because it was such an unknown for me, I considered just letting his request blow over. Then another sensible grown-up, after hearing Calvin’s recipe, quickly made the connection that he was talking about deviled eggs. And finally, it adds up for me. Now, I was game. We checked to discover there were six eggs left in the egg carton. We agreed to use five and leave one for dad’s breakfast. The other two essentials were also on-hand: mustard and mayo. 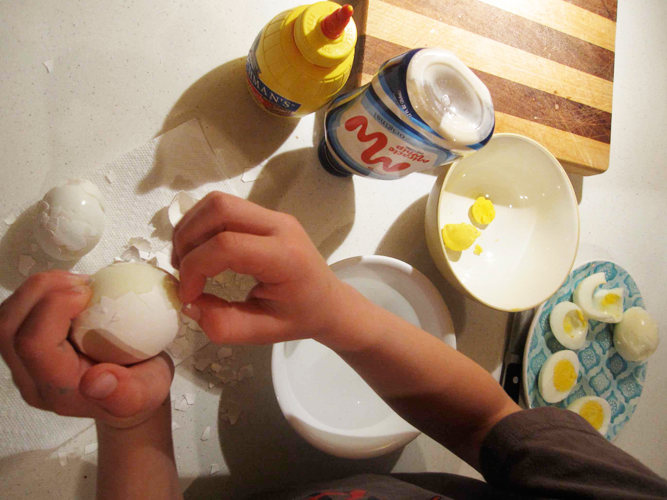 For the simple act of hard-boiling an egg, there are thousands of theories on how-to. My husband and I have had heated discussions quite frequently about the best way to do so. We now know that my method works. After you place the eggs in a pot, fill to cover them with two inches of water. Boil for 7 minutes, remove with slotted spoon, submerge in a bowl of ice water, crack them on a hard surface, then slip off the shell while submerging again. See the modern-day wiki video as proof. Calvin ran the show. 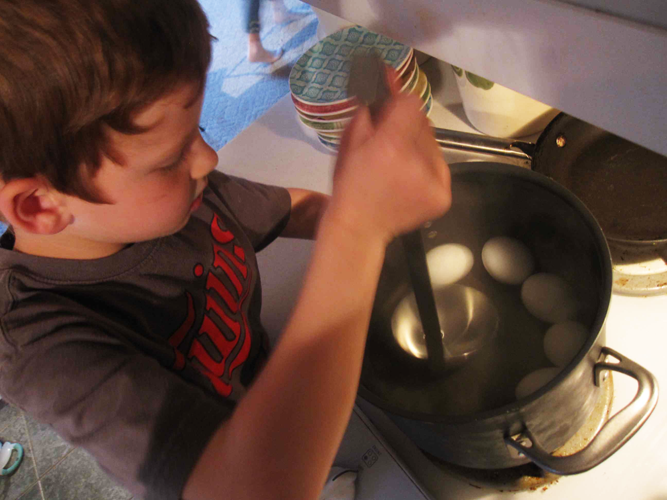 After a 7 minute boil, he took all of the eggs out and we got to cracking and peeling. An exercise in patience. For some, the shell did not go so well. Next step: cut them in half. The whites might have torn a little in the de-yolking process, making it tough to get that deviled stuff back into the hollowed out white while looking delectable. The yellow yolks were mashed with a fork and with only a spoon for loose measuring, he went back and forth alternating mayo and mustard additions. He was going for taste and consistency. He got it to his liking, then we took a short break. When we returned to the task, we filled the 10 halves with the mustardy mixture and admired our work. We brought them to the table. I left momentarily to get a few glasses of water. I returned and that kid had eaten 5 of the halves single-handedly. When my 7-yr-old and I tried them, we gave them pretty high marks. I was impressed that he taught me a new skill in the kitchen with no crutch of a recipe for exact measuring or my help. He has since been beaming with confidence and has taken pleasure in sharing the fact that before him, I didn’t even know what a deviled egg was. Not entirely true, but I have not bothered to correct him. After all, he did enlighten me and reverse the norm of parent as teacher to child. I had the pleasure of cooking with Chef Incredible for Easter treat-making this year. Together we made some incredible inedible eggs. As it turns out this recipe, while wildly whimsical and scientific, is not one we’d recommend. If you insist, have at it though. Just swap out the (decorative colored) sand with just about anything else. This Martha Stewart recipe for Marshmallow Easter Critters is unforgiving if your m.o. in the kitchen is relaxation and checking back in with the recipe after each step. We learned how critical timing was the first go around with what MS termed Marshmallow Magic. The gelatin sat about a minute too long and the syrup portion went only 3-4 degrees higher than the perfect 238. The boiling syrup (obviously no kids near while this was going on…) when added to the mixing bowl, definitely sparked a reaction with the gelatin. Just not the one I envisioned. We all agreed that it was not looking promising, but we just had to optimistically turn on the mixer. The beaters didn’t budge. I’m convinced I nearly broke the mixer. The hard “candy” confection we had created in 9 seconds would not let go of any surface. I actually sliced my finger trying to get it off of the spatula. 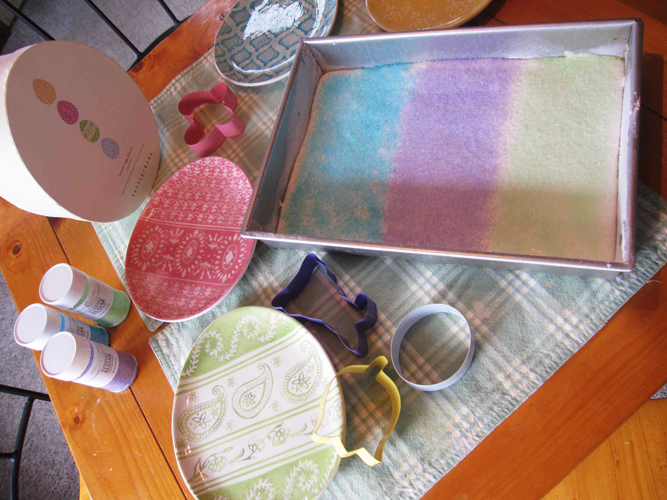 Sugared Sand or Sanding Sugar? I could not let the Easter attempt go down in this fashion. After a little first aid, we prepped again. The ingredients are cheap and simple really. Sugar, water, gelatin, sugar, vanilla extract and sand. Both kids seemed in disbelief that we’d try it again after failing so miserably. On the second attempt, we got the timing and temps right (always use a candy thermometer). Success! The syrup reached the right temp at the right time, along with a little monitoring of the temp control on the burner. The mixer spent 10 whole minutes transforming the clear liquid to white fluffy peaks – just like Martha said it would. Scientific exploration at its best. We spread it out in our pan and sprinkled with that sugar in three even sections and let it set for an hour. 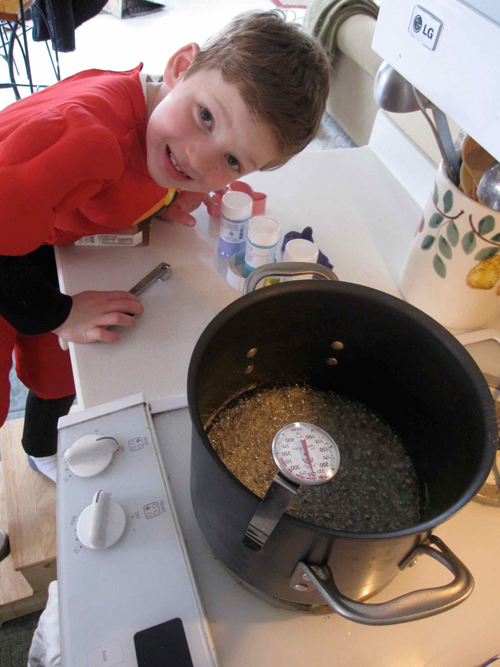 Chef Incredible, my son, poked it quite a bit – testing…. 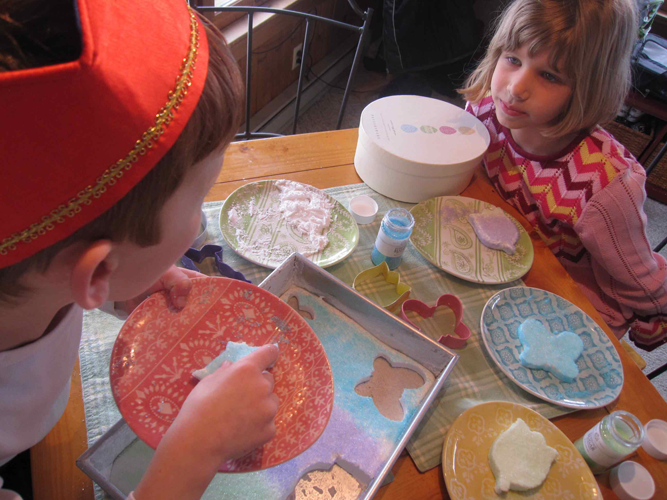 Finally the kids were ready to take the sugar cookie cut-outs to the pan of spongy marshmallows. The critters separated nicely. Regrettably, we rolled the edges in more of that sand. The result: over-sugared bunnies, eggs, butterflies and tulips. In hindsight, the marshmallows alone would have tasted yummy. I’m sure Martha hosted several kids’ focus groups for all the treats in April 2011 issue. I would have to think the sugar in these hyped them up a bit? Maybe the parents settled on this observation: If you want eye-appealing decor to last until Easter and you don’t actually want to be tempted to eat your Easter treats, make these. I haven’t thought much about roller skating since the eighties. Did it make it past that decade? My kids certainly weren’t begging me to take them skating, but after a Friday night at the Roller Garden you can bet they are now. Since a brief mention of Friday’s plans to them on Monday, the outing had totally slipped their minds. Friday can be hit or miss. Kids and mommy alike are usually pretty tired after a long week. We met some friends there – a friend of mine and her daughter-in-law to be. Once again, I gave ourselves a 1.5 hour time limit – at $8 a head ($5 to skates, $3 for the rentals), we needed to give the introduction to skating it’s due. I told them if they didn’t like it or wanted to sit out – that was fine. Mom was going to be regaining her skating legs. We checked in and checked out skates. 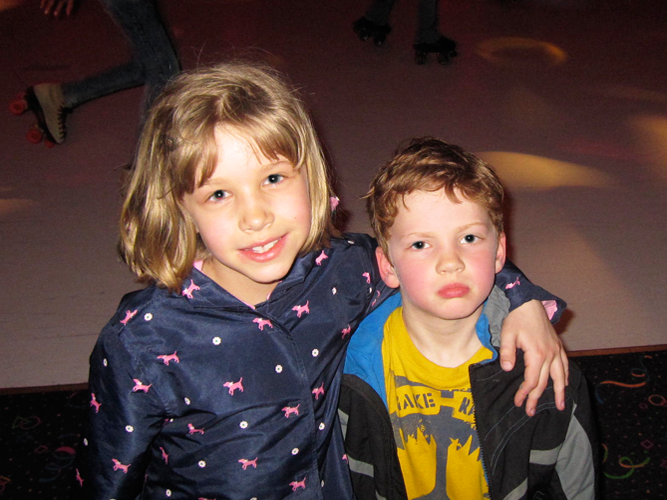 It was family skate night from 4:30-8:00 so the crowd was sympathetic to newbies and if someone rolled over your fingers after a fall, at least you had a good chance it was a lightweight. They also claimed the music would be clean, a genre I couldn’t wrap my head around – does that mean Wiggles or KooKooKangaroo? No, thankfully it ended up meaning top 40 from 1980 to 2011. We laced up our skates which were comfortable for all but Ava. Stop complaining I told her. 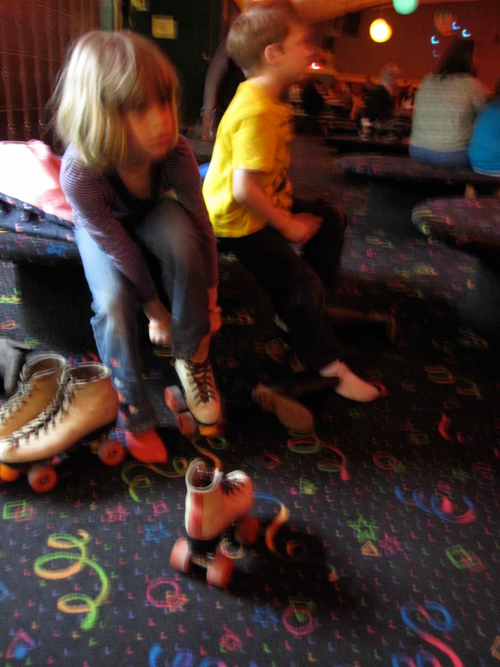 A half-hour later, she insisted that one of her skates was swapped with her brother’s skate, two sizes too small. She was right. Things improved dramatically for her from that moment on. I grew up skating quite a bit. No rink for me has ever topped the Majestic in Arnolds Park, IA. Right on the lake, cool summer breezes would blow through while the pulse of the amusement park beat in the background. Bright lights. The close screams from the Legend rollercoaster’s track within inches of the rink (watch the video – it takes you right by the rink). Friday night dance music. Skating backward, in circles, even the limbo. The Roller Garden, however, was really growing on me despite the implied cartoony and cheesy vibe of its website. It has a carpeted area level with the rink along one side where new skaters can do some testing. It also had a side area that was sectioned off so skaters could build confidence before hitting the big rink. At age 5, my son would have no part in that area. He began employing a skater-run technique. Ava, my 7-yr-old, more cautiously tested things out employing the glide and lean technique. Respective fall ratio: 8:1. Nobody complained though. Between the upbeat music, blinding quick lighting changes and special effects (fog machine for Thriller), there were brief rest breaks and a pretzel to sustain them. They lasted 2.25 hours. It was stress-free. I go could at my own pace and keep an eye on both of them. If they were taking a break, I could also see that. After some speed-skating crossovers, we ended the night. A bit reluctantly for Ava, but much needed for Calvin, who looked like he was about to drop. We headed over to Fireside pizza. They were absolutely giddy as we dished about skating styles, number of falls and upcoming birthday party planning. 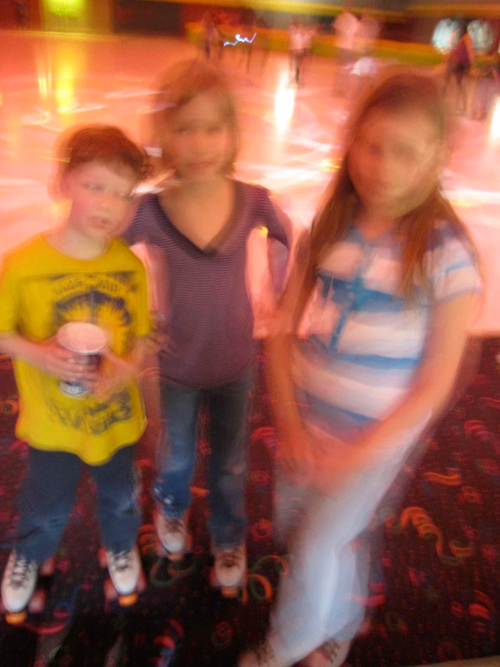 So as it turns out, roller skating is as cool now as it was then. Word of advice: Girls – don’t forget your wide-toothed pink comb for your back pocket as it’s still super fun for the boys to try to steal.